The Valhalla 3030A is one of the smallest, most cost effective instruments for the measurement and analysis of single and three phase electric power. It lets the user analyze energy usage and costs. You can evaluate power quality, troubleshoot wiring and equipment energy use, and perform true three phase measurements for less than the cost of a single phase instrument. 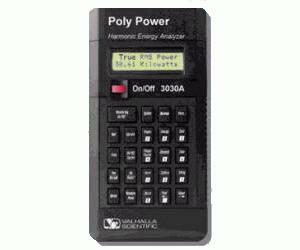 As a Demand Analyzer, the 3030A tracks power consumption, Energy, Cost, Harmonic Distortion, True Watts, Kilowatt-Hours (KWHr),True RMS Volts, Amps, True Power Factor (W/VA) and more. Graphs and individual waveforms can be uploaded to a PC for analysis. The Valhalla 3030A capability includes: single and three phase voltage, current, power (watts), energy (KWHrs), cost, power factor (p.f. ), total harmonic distortion, transients (spikes), frequency, duty cycle, and power cycles. It also stores in non-volatile memory two complete sets of waveforms (saves 14 signals- 3Ø) as standard. The Valhalla 3030A also measures 3Ø delta voltages - (phase to phase voltages) and current levels as standard. Primary/secondary ratios for current transformers (CTs) and potential transformers (PTs) can be entered into the unit for recording of primary values when monitoring secondary outputs, to provide automatic scaling for energy measurements (Kilowatt Hours). The Valhalla 3030A measures each phase to phase voltage and current in a three phase delta configuration. Total 3Ø power factor may also be displayed. The PC Control Analysis software provides simultaneous voltage and current measurement sequencing. There is no waiting or cycle time delays between the voltage or current data.